I was reminded of his words a few weeks back. I was sitting in my dining room, talking to my friend Jeremy and his family about my work at the Coalition to Stop Gun Violence. We were discussing the gun lobby’s current campaign to allow individuals to carry loaded handguns in public spaces across America—churches, parks, schools, government buildings, child day care centers, metro transportation, airports, etc.—when Jeremy’s nine year-old son Colin piped in. “There are people who think you can prevent violence with guns?” he asked. “That’s right,” we told him. “Cuckoo,” Colin replied, tracing rings around his ear with his finger. I was pleasantly surprised. It’s not that Colin isn’t a great kid; he is. But he’s been obsessed with guns since he was a baby. I distinctly remember a boy of two—denied toy guns by his parents—running around with a vacuum cleaner tube and “shooting” everything around him. Now, a few years later, he’s graduated to air guns, water guns and violent video games like Commando 2. This fascination with firearms that boys seemingly acquire upon exiting the womb is both awe-inspiring and disturbing. So how does this young boy, who delights in shooting his guests with his Nerf N-Strike Maverick Blaster rifle, have the maturity to grasp the enormous danger that real guns represent to our society? Why is he is able to embrace the thrill of violence in fantasy while rejecting it completely in reality? I must have had my own good influences because, like Colin, I grew up with a gun obsession. One of my prized possessions as a boy was a plastic M-60 rifle, complete with unfolding tripod. My friends and I loved to get our toy guns out and play “war” around our elementary school. I was also in the first generation of video gamers, and played all the shooters: Postal, Castle Wolfenstein, Doom, Duke Nukem, Quake, Soldier of Fortune, you name it. And movies? Die Hard, Predator, Assault on Precinct 13—I loved all that stuff. Yet I never had the desire to own any real firearms, or mimic the “protagonists” of these games/movies in real life. 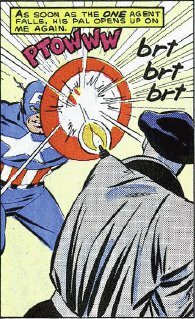 I was a big fan of Marvel Comics growing up and it always struck me that Captain America never carried a gun—the bad guys he brought to justice did. Today, as a husband and father, I have become a passionate advocate for nonviolence. That’s a goal that’s worth working for, but until it is realized, we should all endeavor to learn from kids like Colin. There’s pros and cons to Catholic School but one definite pro to the one my parents sent me to was that it did have non-violence/peace as part of our grade school curriculum! Despite my natural attraction to guns as a boy my mother refused to buy us (I was one of 3)so much as a water pistol. She abhorred violence and saw no reason to promote it in our household. Of course we acquired the toys in other ways and managed to play our games of war anyway. However, when in my 20’s, I became the victim of violent crimes twice within the same month (in the first incident I had been beaten so bad by a mob that I couldn’t remember my own name or address for short spell) I thought the answer would be to protect myself with fire power. Despite everything I was taught as I child I planned to buy a gun. But even through my anger/frustration/fear I realized that owning a gun would simply invite the very violence I was seeking to expel. Even in the best case scenarios what could a gun do? I save myself by being quicker on the draw? Even if i thought I could pull the trigger at all, much less first, could I live with the consequences of paralyzing or killing someone else? Could I endure a police investigation? What of accidents? I never got the gun. When I was engaged and my pregnant girlfriend moved in with me a close friend of hers mailed her a gun for protection in the big city. My ex is a hippy at heart, all peace and love, but she too had been a victim of violence herself in the past and made the argument to keep it. I refused. To have a gun in the house with my child was absolutely unacceptable. I made her get rid of it. It was probably the only argument that I ever won with that woman. One, that in hindsight, I think she agrees with me… and my mom. A gun is a tool, no more deadly than any other tool when misused. pan, a scarf, a pair of nylons and on and on and on. Vivia, today’s firearms are far more lethal than the other objects you cite in your comment, and that is why guns are the weapon of choice for those who kill in our country. 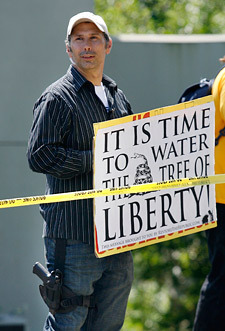 I can respect the stance of true non-violence, and especially the strength shown by those who have truly practiced it. It takes a lot to choose to take a beating and not fight back. I just can’t be one of those people. I value my life and my limbs. Not merely for my sake, but for the ones I love who would suffer should I die or be crippled. This doesn’t mean I ever want to stand on that brink again. The one time I had to draw a weapon on someone, I was an emotional wreck afterward, and I didn’t even have to fire. I’m not ashamed to say I cried, thinking that I was very literally an inch away from possibly ending a man’s life simply to prolong mine. I thought about how it would feel to be a member of his family, had I been forced to finish pulling the trigger. But, then I realized the truth. *I* did not force that situation to happen. *I* did not make it a life-or-death moment. Would I have felt completely without blame had I killed in self-defense? Not at all. I probably would have sold my guns in self-hate over it. Today, I value myself greater than I did back then. I still never want to point a weapon at another person, but I won’t hesitate to if that’s the alternative to death or serious injury. Gun ownership, for nearly all who possess them, is not the preparation to unleash violence, it is being prepared to face violence. Those who own guns for violent reasons are a slim percentage. The conservative estimate of the number of gun owners, prior to Obama Fever hitting the nation, as 78 million. If there were 30,000 deaths via gun that year, and each was done by a different gun owner, that means that 77,970,000 gun owners didn’t kill anyone that year.